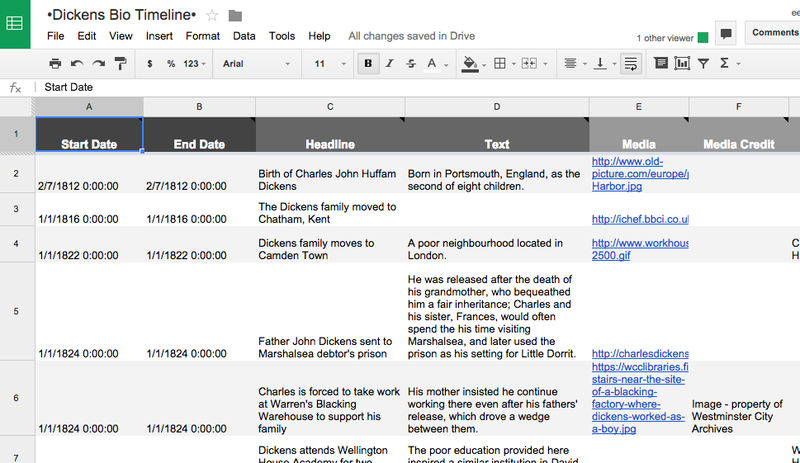 The purpose of this project was to research the correlation between Charles Dickens’ writings and personal life. In order to examine these two aspects in a coherent manner, we utilized the Timeline JS software to create two separate timelines: one detailing his publication history, the other detailing his personal one. Along with some basic preliminary research, we were able to find some strong parallels between the two and determined that the events of Dickens’ personal life were unusually influential on his writing in that nearly every work featured a person, place or event that occurred in reality. 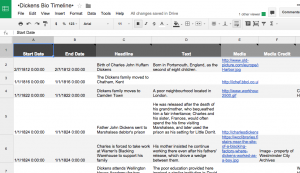 A free open-source tool, TimelineJS, sends users a simple Google Drive Excel spreadsheet, and this is all that is needed for the construction of the timeline. While it is easy enough to enter the data in the self-explanatory columns (Start Date, Text, Media, etc. ), some have nifty features that require a bit of tinkering. Tags, for example, allow a timeliner to stack multiple lines on top of each other, thus not only advancing in time, but showing different aspects or types of events separated from each other. Type allows for “eras” to be shown as a span of time, encompassing the individual events within that range. Another cool feature, Hash Bookmarks, allows individual items in the timeline to be linked to, as each item adds to the URL. It became clear as our research proceeded that Dickens was highly inspired by his own experiences and trials in life when writing his works. One would be hard-pressed to find a significant moment from his life that did not bleed through into his writing in some form, from his professional careers to his romantic leanings to his time at home. One of the earliest examples was his experience with child labor: at the age of ten, Dickens moved to a poor neighborhood in London with his family, and two years later his father was sent to a debtor’s prison, forcing the young Dickens into a blacking factory to support his family. The neighborhood and workhouse in question later came to influence the writing of Oliver Twist, one of his earliest novels. After his poor experience in the workhouse during his youth, Dickens attended a poorly run academy (inspiring portrayals of similar schools in Nicholas Nickelby and David Copperfield) for two years, before dropping out to work as an office by in a law firm. His work with legal clerks and professionals would help inspire characters like Jaggers and Wemmick from Great Expectations, Mr. Guppy from Bleak House, and Uriah Heep from David Copperfield as well. Another interesting tie to Dickens’ professional life lies in his zeal for acting and performance: he strongly considered becoming a professional actor in his youth, and only decided against it after missing an audition due to illness. Not only would this love of public speaking and mimicry return with his wildly successful speaking tours, but in several of his novels as well, with characters like Nicholas Nickelby or Mr. Wopsle showing his enduring fondness for the stage. At a young age, Dickens fell in love with a beautiful but cold and distant woman, Maria Beadnell, whose parents forbade any relationship between the two and who had little interest in Dickens regardless. The idea of seemingly hopeless or unrequited love that is interrupted by circumstance or economic standing is visited in several Dickens works, including Great Expectations with the character of Estella and David Copperfield with Dora. Another intriguing woman that found her way into Dickens’ writing was his young sister-in-law, Mary Scott Horgarth, whose early death was frequently idealized by the writer. She was his inspiration for the characters of Rose from Oliver Twist and Little Nell from The Old Curiosity Shop whose death was based on Mary’s early demise. Though those were two of the most specific examples, the idea of the young, beautiful, unfailingly polite lady that often dies suddenly repeats frequently in Dickens’ work, forming the basis of dozens of his characters. Not only did parts of Dickens’ past repeat in his fiction, but certain aspects of his writing seem to have come through to his real life. He went so far as to name his daughter Dora after his character Dora Spenlow, the child bride of David Copperfield, and he nicknamed his son Francis “the Chickenstalker” after the character of Mrs. Chickenstalker from “The Chimes.” His son, Henry Fielding Dickens, was obviously named after Henry Fielding, who was one of Dickens’ favourite authors. Interestingly enough, Dickens’ almost named little Henry ‘Oliver’ after the author Oliver Goldsmith, but refrained from doing so since he thought that his son would be teased as “Oliver asking for more” – clearly the sign of a thoughtful father! Dickens’ writing and personal life were intrinsically connected, almost to the point of being difficult to separate one from the other. Though he did not start seriously writing until adulthood, his childhood was hugely formative in the direction his novels would take throughout his career. Clearly Dickens’ experiences in the slums had a massive effect on him, perhaps to the point of being traumatic, as “the plight of the poor” became an ongoing motif in his writing. However, In spite of this discovery, the bulk of our research centered around Dickens as a husband and father, as we found many pieces of evidence contrary to the common perception of Dickens being an absent family man. His attention to his writing was unparalleled, and so his devotion to his family was rather limited by modern standards. Yet when he did focus on his family, his children in particular, he proved to be a strict disciplinarian and firm taskmaster who did not tolerate any sort of tomfoolery. That is not to say, however, that he was an uncaring father. His daughter Mary “Mamie” Dickens recalled a number of happy memories about her father in the posthumous biography she wrote, and Dickens took sole custody of the children after his divorce from Catherine Hogarth, believing that it was in the children’s best interests. Though this might be viewed as a controversial decision, it is clear that Dickens did genuinely believe that he was doing right by his children. As we have seen from the timeline, many of his literary characters were based off of his children and other members of his extended family. In addition, many of his children were named after some of the literary giants of the century, a few of whom, such as Alfred, Lord Tennyson, were named godparents to the Dickens children. Though it is clear that the literary world was a huge factor in the lives of the Dickens family, we found that Dickens himself often allowed his personal feelings – namely romantic love and grief – to interfere with his writing. When his beloved sister-in-law Mary died, Dickens canceled that month’s installments of both The Pickwick Papers and Oliver Twist out of grief; he was similarly affected when his infant daughter Dora passed away. While we believe it is fair to say that Dickens was not a model family man, he obviously cared deeply for his loved ones and was not quite the cold, stern father many perceive him to be. Dickens used his personal life as inspiration for his always growing literary career, which meant that he payed a great deal of attention to his family even though he wasn’t always present in their daily lives. Ackroyd, Peter. Dickens: Public Life and Private Passion. London: BBC Worldwide Ltd, 2002. Print. Dickens, Mary. My Father as I Recall Him. London: Roxburghe Press, 1886. Print. Forster, John. The Life of Charles Dickens. London: Cambridge University Press., 1874. Print. This entry was posted in Uncategorized on December 12, 2014 by Erin Duffy.